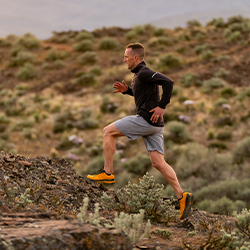 Ultraventure was designed with features inspired by our elite trail and ultrarunners. An aggressive Vibram® XS Trek outsole provides traction, durability, and protection on technical trails, while the 3 piece, multi-density EVA midsole offers light stability through the gait cycle. A 30/25mm stack height (5mm drop) delivers a plush and protective ride. The fully gusseted tongue and an abrasion-resistant engineered mesh upper are optimized for breathability and strength, and feature drainage “gills” for water release and quick drying. Ultraventure also features our uniquely fitted gaiter attachment, making it fully compatible with our stretch nylon Topo gaiter (optional and sold separately). Great addition to the Topo line up!! Already own 2 pairs through the REI pre-sale and I must say..THANK YOU for making a higher stack/higher cushion shoe. I already have 3 pairs of runventures for shorter trail runs and have 2 pairs terraventures for a little more distance but those shoes were just not enough for a longer, rougher trail run...but this shoe has filled the bill perfectly. I am currently a Topo Athletic ambassador, but have loved the Ultrafly even before I became an ambassador. I bought this model for my wife and me recently and we are both very happy with the style and fit. We are not runners, simply always looking for a well made, durable, comfortable athletic shoe for walking, hiking and casual wear. This shoe ticks all the boxes. The wide toe box, cushioned insole and vibram sole cannot be beat by any other brands we have owned. 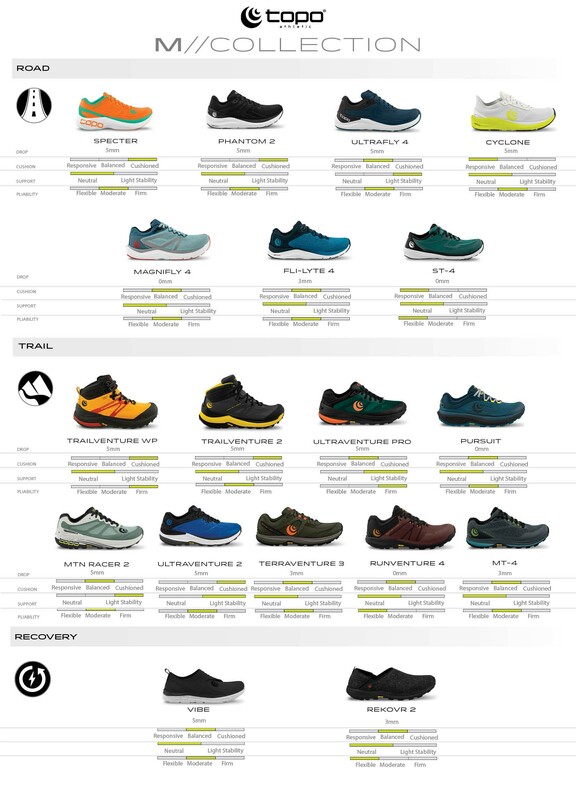 I personally plan to buy a second pair and hope Topo continues to offer the Ultraventure. The only improvement I would want is perhaps added color choices. I'm so glad to have discovered Topo Athletic! Not as wide as mine other running shoes. the shoes were 1/2 inch narrower than my Asics in the same size. 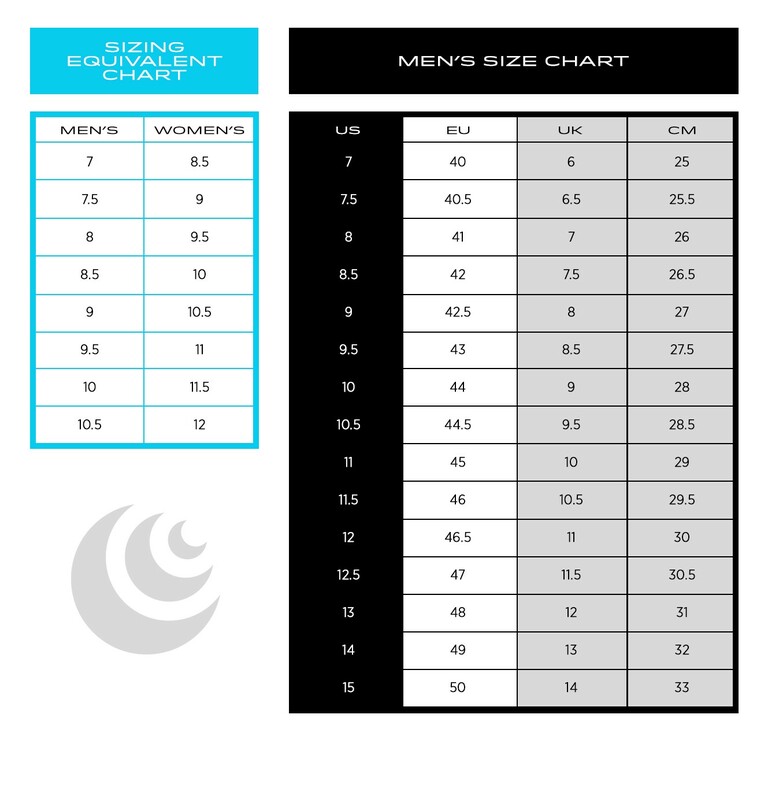 The manufacturer has no measurements of the sole width or length. I was disappointed the shoe is too narrow. The shoe looks well made. I returned mine for a refund. I have pictures, but there is nowhere to post them. With 10 miles on these shoes, completed the Chattanooga 100! I can say no blister or feet problems at all! Unbelievable show!! Thank you for a great product! Great Trail Shoes. Get the Gaiters too! Great trail shoes. A lot of support and good cushioning. Just ran a 50 mile trail run through mud and streams and they performed extremely well. Gaiters were also great. They kept out everything (except the water of course) and never came unhooked. I highly recommend these shoes. I know it’s not their intended use but two days after buying a pair of Ultraventures I spent the entire night standing next to a hospital crib with a very sick baby so I wore my new shoes. Could not have done that with any of my other shoes. Just recently bought these shoes by hearing all the rave about how cushioned this pair was. I have been hiking in some Runventure 2’s for quite a bit now (100 miles or so) and all I can say is wow! Those shoes have been the best pair I’ve owned for hiking. I don’t do any trail running but I use it for the lightness instead of lugging around heavy boots on my feet. I liked them so much that I went ahead and purchased a pair of Ultraventures knowing that they would have more cushion and durability would be great and man was I blown away by how well these felt on my feet! I was pleasantly surprised by how cushiony these Ultraventures felt. Prior to having Topo trail runners, I had a pair of Altra Lone Peak 4.0’s and had to return them because of the feel of them being sloppy. If I were thru hiking a long distance trail, these Ultraventures would be my go to due to the cushioning, durability, and overall feel of the shoe especially the toe box. Would definitely recommend this shoe! After a great experience with my new Ultraflys, I decided to try Topo for their trail shoes. I wanted the Ultraventure for the additional cushioning, as I wanted these to become my shoes for further long runs (+15 miles) and any trail marathons or ultramarathons. They fit similar to the Ultraflys. The roomy toe box is awesome, especially when you're going downhills. However, the heel and middle of the foot still stay snug in the shoe, which is nice. Also, after a few puddles and splashes, they seemed to dry out pretty fast; maybe those were the drainage gills working? My only complaints are how the toes curve up more than the Ultraflys, which can feel a little awkward on hard surfaces, and the weak grip on mossy, damp rocks, but most shoes fail here too. No big deal breakers. Overall, I'd buy again. Good job Topo! Keep making great products. And thanks to Russ at Topo customer service, for going out of his way to help me with sizing. I am a Topo ambassador, but I would be rocking these shoes even if I weren't. The grip on them is amazing. I've taken them up wet boulders, down steep descents, and through rocky terrain, and they have passed every test. Despite the lack of a rock plate, I do not feel the rocks or roots on our Arkansas trails. I’m a Topo ambassador and I was waiting to get enough miles on these bad boys before I would give a review. I now have about 400 miles on my Ultraventure and I gotta say I’m super impressed as I think I have plenty of life left in the shoe. I’ve ran 4 ultras in them from muddy water crossing to miles and miles of sand and many training miles on the rocky unforgiving terrain of Arizona that I mainly run on. Not a single tear in the upper the shoes haven’t flattened out so I’m not finished with them yet. They are my go to shoe and I couldn’t be happier and my feet couldn’t be happier, I definitely would recommend them. This is my 6th pair of Topo shoes. I normally run trails in my Terraventure 2 shoes which I have found to be perfect for me. Purchased this shoes at REI with a gift card. I wasn't sure what to expect. What I found was a great shoes for smooth trails and fire road type running. Ran a 13 milers on dirt roads straight out of the box. Found this shoes to be extremely comfortable. I can understand Ultra is used in the name. I felt I could run all day in this shoes. Shoe vents very well and is very durable. For rocky and rough terrain, I'll stick with the Terraventures. But, this will be my shoe for an ultra race on an old railroad bed I'll be running this summer. Even here in the Netherlands, we are running in Topo Athletic shoes. This is already mine 5th pair of Topo's and I must say that this one is really fantastic. More cushion than the Terraventure and MT-2 which is especially welcome during the longer runs. 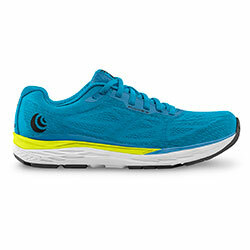 Likes: cushion (energy return) lightweight, lacing, protection even without a rock plate, and the width. I have no dislikes !! I heard about Topo from the Ultrarunning Podcast and wish I tried them sooner. I had been wearing a different brand of shoe known for having a roomy toe box and zero drop for three years and had persistent issues with an inadequate heel lock, too loose of a midfoot fit, sizing inconsistencies, inadequate durability, and premature midsole flattening. Updated and new shoes from these brand were inconsistently addressing these items. 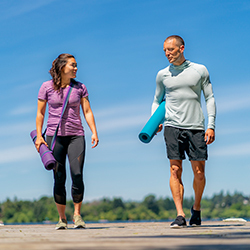 Topo’s Ultraventure addresses these concerns and fits better for me. After a hundred miles, the shoe shows no signs of wear and the midsole has not flattened. The improved fit helps with control and I have fewer hot spots. The deep and spaced out lugs help with gripping soft or wet trails and sheds debris well. I had no issues with the low drop; my first run with the Ultraventure was 23 miles on trails. The toe box is adequately roomy. Overall, I’m very happy with Topo and am looking forward to switching my trail and road shoes over to Topo.